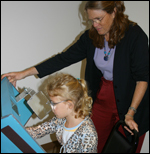 Lifetime Eye Care has been providing Vision Therapy Services for patients since 1981. 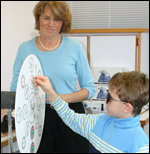 We place great value in offering Vision Therapy to those requiring assistance with visual comfort and efficient visual performance in order to achieve their full potential. The 2008 National Institute of Health Convergence Insufficiency Treatment Trial clearly supports the superiority of office-based vision therapy over home-based vision therapy alone for convergence insufficiency. The preferred clinical management therefore consists of in-office vision therapy supplemented with home therapy. Research shows that adults do, in fact, exhibit neuroplasticity. You can use this innate ability to treat a variety of visual system disorders. By Dominick M. Maino, O.D., M.Ed. Goal Statement: Because an adult brain can change, end organs, such as the eye, can be cortically altered, show improvement after insult and injury, and be remediated and enhanced. This paper provides an overview of neuroplasticity and demonstrates how optometrists can take advantage of this innate ability in adult patients.